Finish 2018 strong by working on your wellness goals with the help of Rocket Wellness. The group is inviting UT students, faculty and staff to focus on finishing the semester healthier than they started with the Rocket Your Way to Wellness Campus Challenge. Participants will compete in a three-week challenge that takes them through a variety of activities from the categories Move Well, Relax Well, Eat Well and Be Well. Those interested can join as part of a team or as an individual and earn prizes that will vary based on participation level. Prizes include gift cards, UT Rocket gear and more. “The University of Toledo wants to help our students, faculty and staff improve their overall well-being, and, of course, have fun. This challenge will help participants complete small behaviors that can lead to big rewards for their personal wellness,” said Wendy Davis, associate vice president and chief human resources officer. The challenge runs from Monday, Oct. 15, through Sunday, Nov. 4; individuals and teams must be signed up for the challenge in order to compete by Friday, Oct. 12. 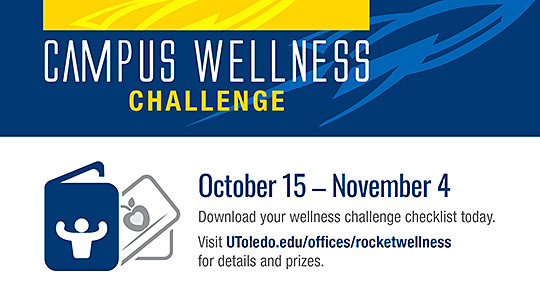 More information regarding the Rocket Your Way to Wellness Campus Challenge can be found here. This entry was posted on Monday, October 8th, 2018 at 3:11 am and is filed under UToday .